Signatures Needed to Save Dunes Beach! All signatures will be submitted to the Half Moon Bay City Council. Sign today! I support the protection of our scenic coastal views, farmlands, habitats, and recreation. I oppose the proposed Surf Beach – Dunes Beach hotel and RV park. Please include me on any info / efforts to Save Dunes Beach! And, don’t forget that the endangered Snowy Plover habitat is just at the foot of this sandy dune bluff! Preservation of beach habitat affects all Californians. Save our coast from tourist traffic and keep our home a natural wonder !!! Let’s make sure we leave behind unspoiled scenery and play grounds for all our next generations! We have an over-abundance of hotel rooms already AND traffic — especially on weekends. And the land needs to be able to absorb water to protect against flooding — which we had last year. Our open space needs to be protected and maintained indefinitely. This proposed development is absolutely surreal in its intent and scope as it pertains to those of us who live here on the mid-coast. It turns a blind eye to the eco-system, the creatures who inhabit it, future generations who want to enjoy the unspoiled coast, not to mention how this will impact our already congested traffic issues. Quite frankly this proposed development is a big FU to all of us who live here. My family lives in HMB and no need to add more traffic and destroy more of the earth. Thank you for the initiative. Count me in. The quality (traffic, auto/road noise) of life will significantly adversely impacted. We need to come together and save Dunes Beach! Stop building for tourist only, it shouldn’t always be about the money! It affects our lives dealing with all the traffic, destroying habitats, destroying the view and what about our water, our sewer and the garbage we get to pick after everyone leaves. We do not need more hotels or traffic congestion on the coast! We do need to preserve habitats and open space. A hotel and “luxury RV site” at Dunes Beach does not represent progress. It represents developers’ profit-driven dreams. Here’s what real progress looks like: preserving this area for future generations to enjoy in its pristeen condition. This area is part of our heritage and part of our responsibility as good stewards of the land. We do the snowy plover a good turn in the process of protecting Dunes Beach, as well. I have spent many peaceful and healing hours on this beach; it feeds the soul just as it is. If you start feeling the urge to develop, go spend some quiet time here first. Let the site speak to your soul. Nature needs to be protected. Traffic needs to be minimized. There’s already a concerning, unnecessary and frankly, frustrating amount of traffic and development on the coast; last thing this community needs is more. I’m extremely against this. We do not need more resorts and RV park in Half Moon Bay. Let us not increase traffic on 1 which is already increased inlets 20 yrs we have lived here. Please save our environment and natural habitat. The city is pushing for an initiative which will destroy our beautiful coastline and secure the influence of profit seeking bottom feeders. An RV park will send trash into our coastal ecosystems and our ocean! Don’t let them ruin the majesty of our space. We’ve already lost Martin’s Beach. My wife and I spent many years going to Martin’s. Can’t let another open space fall to development. Save this beach! We only have so much environment to preserve. Please preserve this beautiful open space and beach in its current natural state. Your interests stem from huge profits only with no consideration for the community who lives here not for the visitors who come to the area who become awestruck with its pristine beauty. There is one way in and one way out via 92. On a normal day, the traffic can be intense. Our infrastructure cannot handle the impact of hundreds of more vehicles coming into this area with their vehicles and trailers. This is a one-sided selfish scheme. We as coastsiders wish to retain this amazing area as it is. My dad used to bring me and my brothers here at least once every month. Don’t let this beach be taken! It is horrifying that we have to fight our own local government to save the environment. Before those uncaring greedy bureaucrats approve this monstrous and unnecessary eyesore, I hope they stop and think about the irreversible damage they will do the the legacy we leave to our children and grandchildren. Make yourselves heard, folks! Vote in November and let’s kick out anyone that is pro this development. We need to stop our coastal areas becoming like the L.A. Coast. What will be left for generations to follow, if we don’t protect what little natural scenery we have left on our coastline? Every weekend traffic is disgusting if you dare attempt the other side of 92/hwy1, cost of purchasing or even renting a home is sickening, the mountains that are BFI will shock from satellite photo..
As a parks volunteer I see how precious this resource is for our coastal ecosystem. Please don’t do anything to endanger the fragile balance that exists. HMB doesn’t need another hotel nor a large parking lot for RVs. We only have so much land in general, and even less coastal land. Let’s preserve and protect what Still exists. I used to own a house in Moss Beach and am appalled at this proposal. This area should be left undeveloped. Furthermore, in this time of rising seas due to climate change building should be much further inland. This is a prime site for parkland. The site for the Dunes Beach development is ajacent to a rare and beautiful group campsite; a unique recreational area near the coastal trail. From this location visitors can hear the surf, the foghorn, and the local birds. They can enjoy the dark night sky in this exceptional environment. There is nowhere else like it and there will never be again. Please protect this local treasure from the horrible destructive impact of the planned development. My name is Stefanie and have lived in or around the bay area for more then 2 decades. It’s a place I love visiting in its pristine nature. I’ve moved out of the bay but continually visit this special place. Please do not change it. As a tourist, I prefer staying elsewhere and coming to visit, an escape from the hustle and bustle. By adding in rentals/housing etc this will remove what most of us have come to live. Please don’t do this. PLEASE don’t. 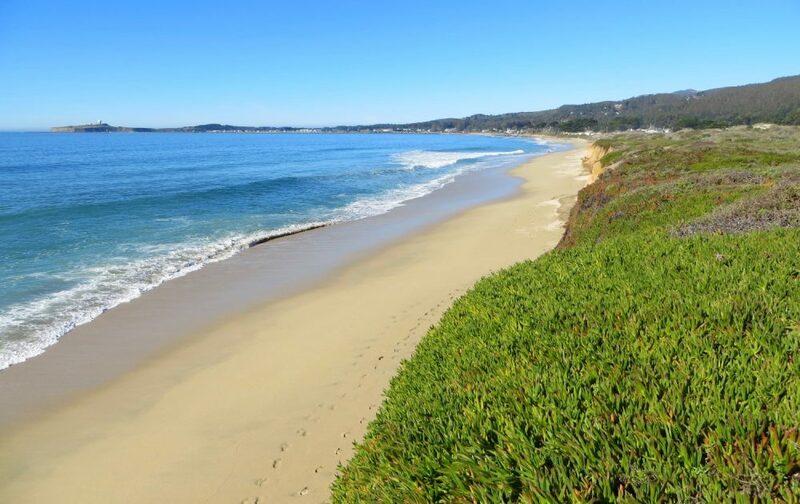 This area of half moon bay is perfect in every way, and to ruin it’s beautiful natural integrity would be very sad. Enough with the development of every open field on the coast. You can always make money but you can’t buy Mother Nature. I cannot image the need in HMB for yet another hotel and RV park. The Coastside transportation infrastructure barely supports the weekend traffic we currently have. Then add to it the planned affordable housing for the Coastside that comes with additional additional full-time vehicles. Seems we’re in the business of make the Coastside great for visitors at the expense of those who live here full time. It’s always about the $$$. The infrastructure on the coast is already stressed. I’m told water and sewer are having trouble supporting what’s already here. Traffic is already impossible with no solution in sight. Why would this development be a good idea other than to line someone’s pockets? This is a disastrous proposal. Beyond the traffic nightmare, it will sully a stretch of coast that is one of the primary reasons we chose to move here nearly 20 years ago. The big question is: Who profits beyond a few developers and landowners? This is beautiful part od our California coast. This highway is already over taxed with traffic and there are more than enough hotels in that area. The whole project seems wrong. Please save the coastal ecosystem of from development. In addition to destroying critical habitat for many key species, the impacts of developing on a fragile coastal habitat will reduce the ecosystem services that they provide. These include services such as reducing storm surge impacts (from imminent sea level rise), natural hazard protection, water flow regulation, and local climate regulation. In addition, building structures and pavement will decrease the aesthetic value of the beach as well. The coast is already congested enough as it is; why entice more tourists (and litter, traffic..etc) onto the coast? Please save Dunes Beach from development. I am encouraged by your efforts with this terrible project. Please keep us posted on how we can help. Dunes Beach was the site of many happy visits by my family. Don’t let development erase this beautiful place. Petition Signed. The Coastside doesn’t need any more Visitor-Serving attractions until the City of Half Moon Bay and San Mateo County can figure out a way to fix the Gridlock we already have. Eventually, no one will want to drive here because it won’t be as nice as nature …it will all be paved-over built-up parking lots full of trash and cars. (“They paved Paradise and put up a parking Lot” – Joni Mitchell) Over-the-Hill Investors/Developers will have their eye on every lovely spot, one vacant parcel at a time. Martin’s Beach is a good example. Just look at the PCH in Southern Califor ia. We need to preserve what we have! Mother Nature is taking our beach already ,please don’t let Developer take away What is left. You must protect this amazing beach. Open space is so important to all of us. Preserve and protect Dunes Beach for generations to enjoy as much as my family has. It’s our job to leave these special places for the next generations to enjoy. We don’t need more Ritz Carlton’s on the San Mateo Coast, we need open space, agriculture and room to breathe. This is absolutely horrible! Pretty soon the entire coast line will be filled with RV’s and commercial conglomerate corporations! I will only tolerate the “little guys” and we need to make sure our community doesn’t get ruined by things like this! WE DON’T HAVE THE ROADS OR INFRASTRUCTURE TO SUPPORT THIS. WE STAND TO LOOSE EVERYTHING THAT MAKES HMB SPECIAL. I HAVE LIVED HERE OVER 24 YEARS AND WE ARE CONTINUALLY OVERWHELMED WITH TRAFFIC. THIS WILL ONLY MAKE THINGS WORSE. What is left of what Half Moon Bay means to so many is represented of what remains of the wonderful fields we ran through as children. Riding on the trails on horses and enjoying the open space and beaches letting your four legged friends enjoy life too is what Half Moon Bay and the Coastside represents. Not luxury RV Parks more hotels, homes on every speck of dirt left with animals leashed on cement sidewalks make this madness stop. Where are our representatives? Quit making profits mean more than the earth, nature and the future of all beings!! Who makes the decisions on these issues about the coast and beaches???? We don’t want or need a resort at Dunes Beach. Similar to the Ritz, the proposed resort will have little economic benefit to the Coastside, as food and employees will come from over the hill. It will mainly benefit the city and district tax base and Silicone Valley companies holding events, but all of us residents will not benefit from it in any way, but we will pay the price of congestion, gridlock and loss of a beautiful coastal bluff and beach front. Its so called green features are a shallow distraction, at best, and of no substance and will in no way cover the lost of green space there now. Plus it sets a destructive precedent that you can build in the coastal zone if as a developer you have big bucks. What will be the next undeveloped coastal parcels along the beach that will be converted to resorts if if the Dunes resort is built? I am opposed to this project for all of the above reasons. An additional concern, which I have not yet not seen listed, is that of how this project would most likely interfere with access to life saving medical care. As an intensive care nurse, I am aware that rapid access to emergency care is critical for stroke, heart attack, and trauma patients. We already have traffic gridlock problems here on the coast, and the increase in vehicles created by this development would only make things worse. Medical evacuation by air has weather/fog limitations. I am strongly opposed to this project. Please no more development on the coast, There are too many developed sites already destroying the natural land and habitat of many species. This coast needs to be protected not developed! Save the coast from development PLEASE! Please save this beach for all who visit the Coastside! I personally gathered more than 2200 of the signatures that were submitted. I don’t think it will change their minds. So we must stand together and oppose this monstrosity. Lets show them what grass roots can do. Besides the terrible loss of precious openspace this project would provide, there is no way we can withstand the added traffic in an already congested area.